Editor’s Note: The following blog post was written originally by Tom Dundon, Santander Consumer USA Inc. chairman and CEO, for his Tom Dundon blog (www.tomdundon.com ) , but the information contained in it may be useful to readers of this blog as well. So we are re-running the column here on the Santander Consumer USA, or SCUSA, blog with the expectation that our chief executive’s optimistic message finds an even wider audience. Future posts on the Tom Dundon blog about Santander Consumer USA topics of broad interest similar to the move to Thanksgiving Tower in Dallas also may be re-published on this blog. Just over two months ago, Santander Consumer USA made a big move – about which people had been talking and reporting for months – with Thanksgiving Tower in downtown Dallas becoming our new corporate home.More than 1,000 associates now occupy eight floors of Thanksgiving Tower. By this time next year, with the influx of additional associates, we will occupy 14 floors of the 50-story building and about 26 percent of its 1.4 million square feet of space. Other tenants in the building are XTO Energy, Petro-Hunt LLC and the law firm of Gardere Wynne Sewell. The new offices represent an upgrade over our former facilities along Stemmons Freeway. Our leadership team worked directly with an interior architecture firm to create studio-style offices to inspire the excellence and teamwork our people bring to their work every day. And associates already are getting accustomed to the many benefits of working at 1601 Elm Street. We’re a short walk from two DART train stations (Akard and St. Paul), and many associates are discovering the advantages of riding the train to work – including arriving at the office without the accumulated stress of commuting by car during the morning rush and evening rush hours. Now, it may seem ironic that a company that generates much of its income from auto lending would encourage use of public transportation, but we don’t see it that way – it’s a quality of life thing. 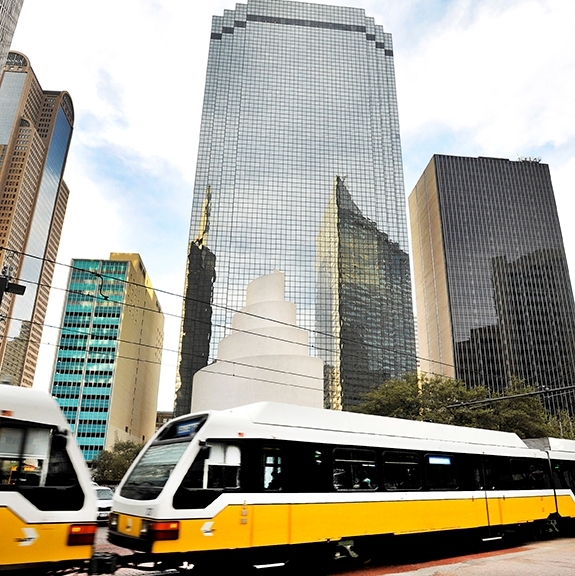 Another major benefit to working at Thanksgiving Tower is the building’s proximity to numerous restaurants, both at street level and in the underground Dallas Pedestrian Network; shopping; arts and entertainment spots, including the 19-block Dallas Arts District, and green spaces such as Klyde Warren Park, Dallas City Hall Plaza, Main Street Garden Park and Thanks-Giving Square. Our expectation is that other associates will feel the same as we move forward together.